When I first moved into my current house, I painted all the walls a plain, boring, light, neutral color. Several years later I decided that boring color had to go. 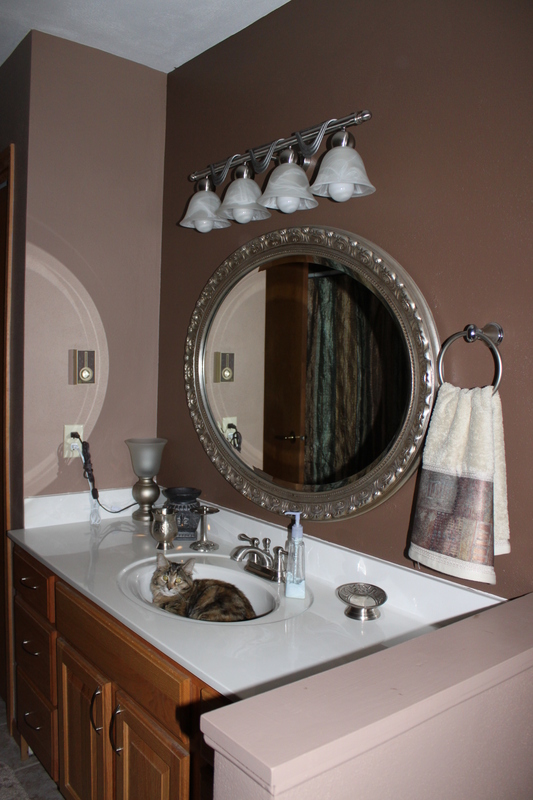 I started with the main bathroom which is also referred to as the girls bathroom. Please note there are two girls in the house (not including the cat). The remainder of the house was done shortly there after. Fast forward now to a about a month ago. A comment was made about “hating the color” of the main bathroom. 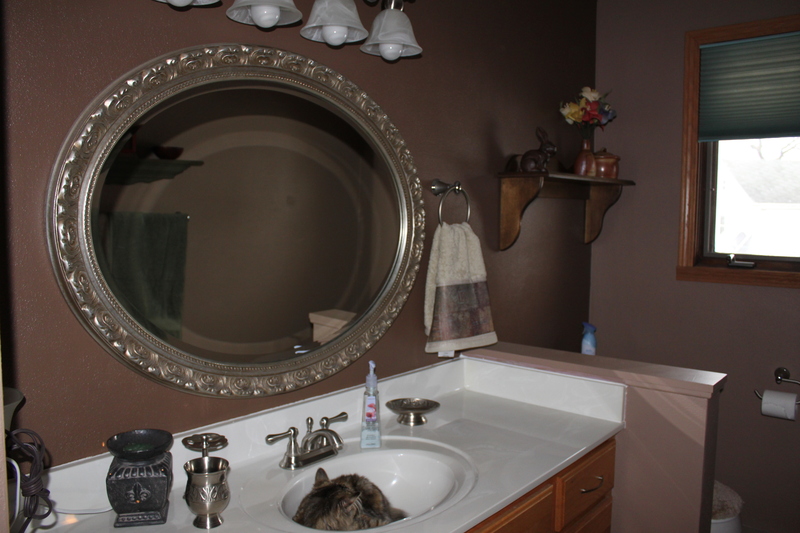 I’m not sure exactly what happened or what was said after that but …the bathroom has been redone. 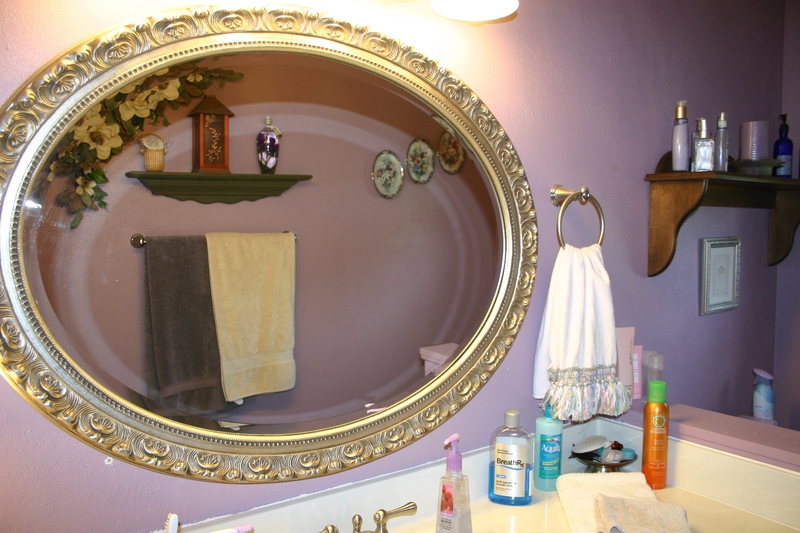 Marissa and I spent the weekend painting the bathroom and then I spent today putting it all back together. All in all it turned out pretty good I think. I still have some paint touching up to do along the baseboards and on the ceiling. Marissa had a couple of ceiling hits. 🙂 Now for the photos. The lighter shade of brown is called Blanket Brown and the darker is called Traditional. The paint is Mautz but the colors are Behr. The Mautz store color matched the paint. Ahhhh …this is where the cat comes in. After painting all day Saturday, I needed some holes filled in on the wall the mirror hangs on. Now, Marissa and I had NO problems with Isabella getting into to the paint however, others in the house did. 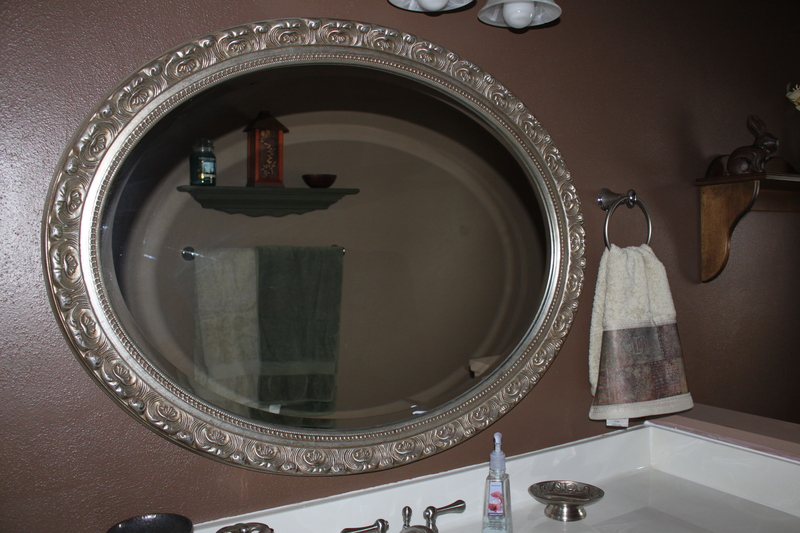 The hole filler was tinted with the lighter brown paint and then the still wet paint tray was placed on closed toilet lid. I’m sure you can guess what happend. You know it. Isabella jumped up onto the toilet, into the paint tray, jumped back down because her little paws got wet and she some how managed to step where the sheet covering the floor was not. I got the thrill of cleaning her paws and there is still one paw print on the floor. However, it blends in quite nicely with the tile so I am not going to stress about it. Now that I have done a little painting and redecorating, I really would like to do some more. I am hoping in the very near future I will have an opportunity to do so. An entire house. I already know the house and I already have ideas and colors floating through my mind. Off to do some stitching for the remainder of the evening and hopefully waking up to some fresh snow tomorrow. Secretly I would like a blizzard but think I’ll be waiting a while for that. ~ by wistitcher on January 10, 2011. I think both the old color and the new color look great! 🙂 I really do love the new one …. nice job! I would be happy to volunteer my house, if you’re feeling especially bored. 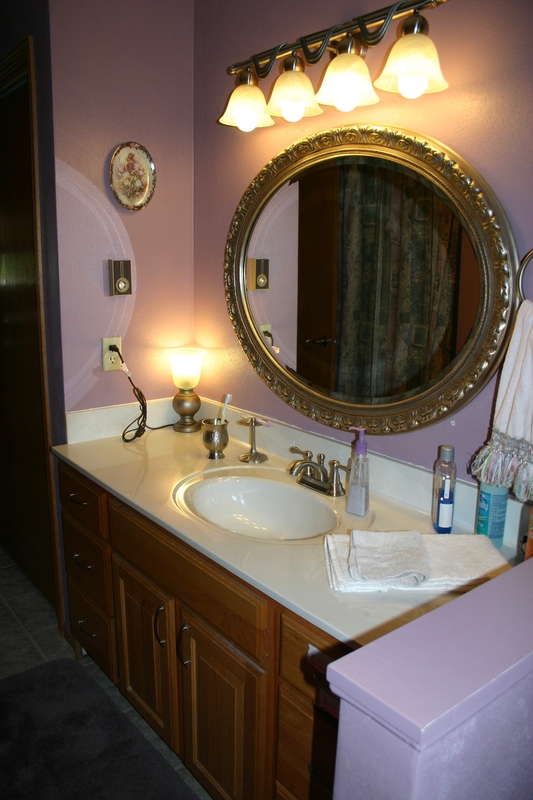 LOL I think the bathroom looks great!